Module allows to control direct-current motor operating torch height. In conjunction with 2001-6A distance sensor it is able to keep constant cutting height of torch above cut material. 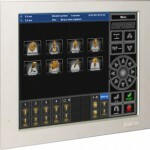 Inputs for manual height control, input for sensor switching and input for torch ignition activation are located on module connector. 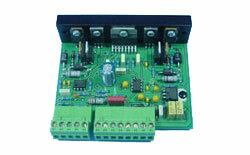 Module supply voltage is 24V-32V which need not to be stabilized. 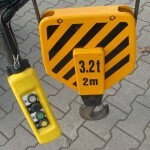 Connected motor has to be equipped with limit switches activated before mechanical ends of torch track. Module operates plasma torch vertical motion in automatic and manual mode. Ignition height of torch is adjusted automatically by means of connected induction sensors. Function of automatic height control can be activated after arc ignition when module operates plasma torch motor on the basis of arc voltage. Supply voltage is 24-32 V unstabilised. Connected motor has to be equipped with limit switches activated before mechanical ends of torch track. In conjunction with module 2001-7A sensor keeps automatically constant height of torch above material. As very distance sensor so-called capacity circle is applied which creates condenser with cut material together. Its capacity is evaluated on the basis of resonance with inductivity contained in sensor. Sensor output is voltage which is directly proportional to distance from material. Its quantity is ranging from 0V-4V. Output voltage dependance on distance is not linear, sensitivity is reducing while material distance is increasing. Furthermore voltage from potentiometer located on card is at disposal. 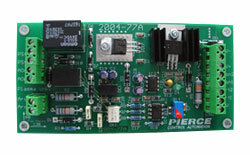 It serves as reference voltage for 2001-7A module in standard wiring. 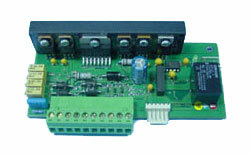 Sensor asks supply voltage ranging from 24V – 32V which need not to be stabilized. Card is equipped with switch-off input as well. 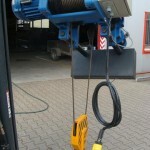 Sensor is able to evaluate breaking off or short circuit of cable for capacity circle. In these cases output voltage drops to 0V, as a result torch moves into the highest position and is not damaged e.g. by running over into material. 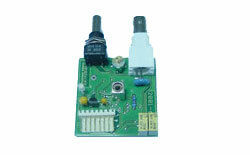 Amplifier board (card) makes for power supply of trackpoint motors in cutting machines. It is designed for direct-current motors with permanent magnets of MT2630-141AF types with installed tachogenerator. High torsional moment even by low revolutions is reached due to feedback of motor tachogenerator . Amplifier is supplied with direct-current voltage ranging from 24V – 32V which has not to be stabilized, it is necessary to use sufficient filtration capacity. Motor revolutions and machine speed are given input control voltage in range from -10V up to 10+V. 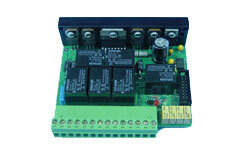 S-amplifier is equipped with inputs of limit switches for both directions of rotation and input of motor switching off. The potential divider is meant for voltage drop measured on the electrode of the plasma torch at the rate of 501:1. Also it contains an element to prevent over-voltage peaks that can occur e.g. during ignition of the arc by high voltage. In the card 2001-5A, there is voltage from the divider compared with reference voltage and based on the difference, the height of the torch above the material is regulated.